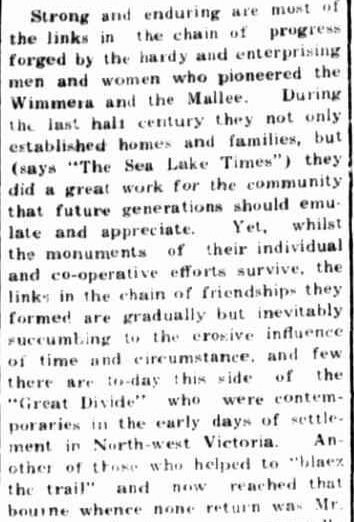 This is the fourth “Passing of the Pioneers” and includes a chess champion who lived in Merino and plenty of Irish influence. 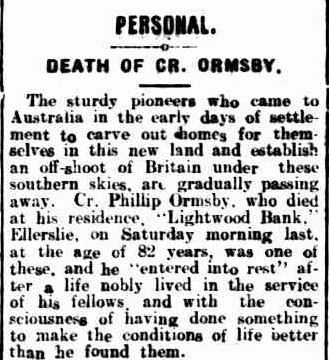 They highlight some of the pioneers of Victoria’s Western District by way of their obituaries as published in the Portland Guardian. If you would like to read the full obituary, just click on the pioneer’s name. Emma WITHERIDGE: Died 4 October 1888 at Portland. 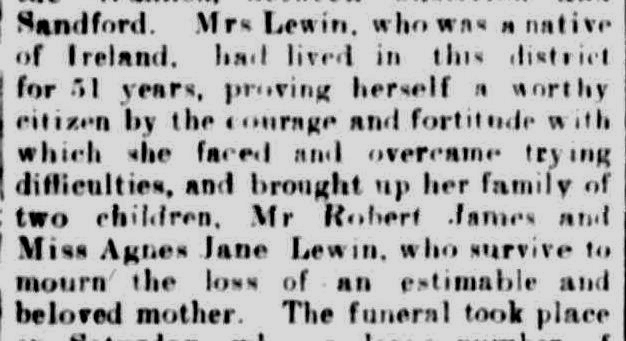 This obituary demonstrates the tone of many at the time. George BEVAN: Died 17 October 1888 at Portland. George owned and died at the London Hotel in Portland. His family notice shows he was born in Somerset, England and was fifty-nine at the time of death. George had been in Portland since the early 1860s and was a keen sportsman and former Town Councillor. Mary ROGERS: Died October 1912 at Greenwald. Mary Rogers was eighty-six at the time of her death and had lived in Victoria for sixty years. She originally went to Tasmania from Ireland with her parents as a small child. Mary married Francis Egan who had passed away thirty years earlier. William Sudgen Price LEWIS: Died 4 October 1915 at Hamilton. William Sudgen Price Lewis was the stepson of Richard Lewis, a former owner of Rifle Downs at Digby. Born in Tasmania in 1835, William and his brother came to live with Richard Lewis when Richard and their mother married in 1841. In adult life, William leased Hilgay station for a time, bred fine livestock and was a member of several racing clubs. He later retired to Hamilton. John H. ROW: Died 27 October 1926 at Portland. 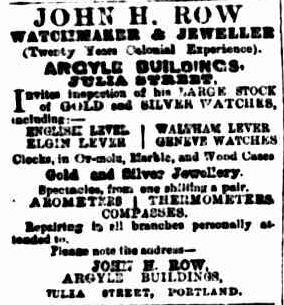 John Row was a Portland jeweller. John McDONNELL: Died 17 October 1930 at Moree. Mr McDonnell was originally from Ireland and arrived in Australia in 1863 via Liverpool. He was considered one of the oldest people in the district. He married Catherine FAHEY and they selected land at Moree in 1865. Catherine Bridget SAMPEY: Died October 1933 at Melbourne. Catherine Sampey arrived in Melbourne from Ireland aboard the Red Jacket in 1852. She travelled on to Chetwynd with her brother James Sampey and she later married Patrick WHITE of Casterton. Elizabeth MONOHAN: Died 12 October 1933 at Casterton. Elizabeth Monohan was 100 when she died. Arriving from Ireland aboard the Frances Henty at age twenty-one, seventy-nine years before, she was still able to converse in Welsh and Gaelic in her later years. 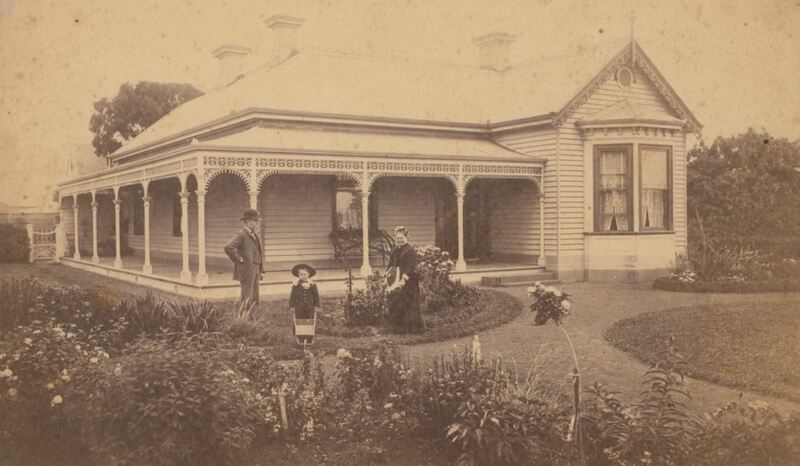 In 1859, she married John Glover at Sandford House. Julia Teresa DOYLE: Died October 1934 at Portland. Born in Tipperary, Ireland but remembered as “a true type of a fine old English lady”, Julia Doyle arrived in Australia as a six-year-old in the mid-1850s. She married Frances SUTTON in 1874 and together they had six daughters and two sons. Ernest John SEALEY: Died 25 October 1935 at Casterton. 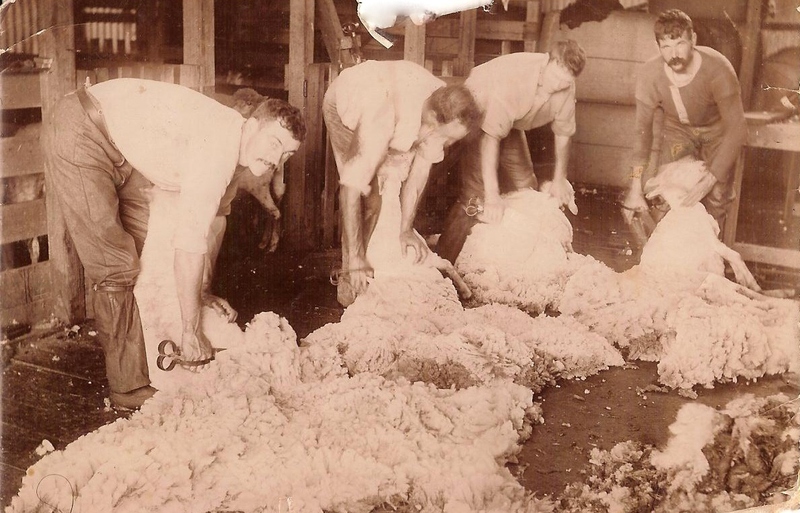 In his younger years, Ernest Sealey worked as a bullock driver transporting wool. In later worked on Portland’s deep-water pier, hauling logs from the forests to the pier. Charles PRATT: Died 26 October 1935 at Birchip. And so begins the obituary of Charles Pratt. Charles or Charley has he was widely known, was born at Mumbannar in 1870. In 1891, he went to Beulah in the Mallee and worked with his step-brother and later selected his own land near Watchupga. He married Annie LAVERY in 1914 and they had three sons. Thomas Denton CLARKE: Died 5 October 1937 at Hamilton. Thomas, born around 1847 at Liverpool, was the son on Captain Thomas H. Clarke who was a trader in Portland. Thomas jnr was a champion chess player and a composer of chess problems. He won many competitions for both pursuits. Composing problems up until his death, it was considered probable, according to the obituary, that he was the world’s oldest composer. James McCLUSKEY: Died October 1942 at Koroit. James McCluskey was born at Portland in 1857, not long after the arrival of his parents on the ship, British Empire. Soon after, the family travelled by bullock wagon to Kirkstall near Warrnambool. In his early working life, James drove pigs to Port Fairy in order to load them on the steamer Casino to go to market in Melbourne. 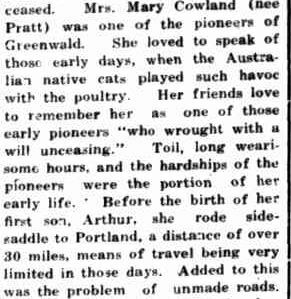 Mary PRATT: Died 7 October 1942 at Greenwald. Mary, the widow of George COWLAND, was eighty-seven at the time or her death. There were twelve children in their family. Her obituary recalled her pioneering traits.